Egyptian President el-Sissi recently made a declaration that the Israeli-Egyptian relationship has never been closer. What is really the nature of the relations between the two nations? And what is the status of President el-Sissi? And the question of all questions: If relations are so good, then who are the Egyptians amassing so much weaponry to fight against? Egypt is going out of its way to praise its current relationship with the State of Israel. 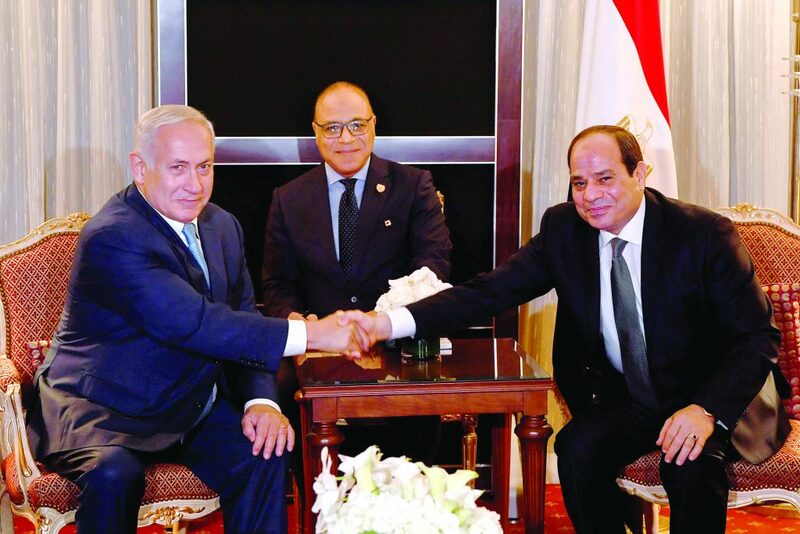 In two interviews that he gave last week, the Egyptian president, Abdel Fatah el-Sissi, told The New York Times and 60 Minutes that cooperation is closer between Egypt and Israel than it has ever been since the peace agreement was signed. Non-Israeli media outlets allowed themselves to share what is not publicly disclosed in Israel: During the last year, Israeli fighter planes attacked more than 100 IS outposts and targets in the Sinai at the request of the Egyptians. Forty-two years have passed since the first peace agreement was signed between Israel and any Arab nation. The agreement was seen by many, and rightfully so, as one of the most important strategic accomplishments of the state of Israel since its founding. The agreement calmed the Egyptian front for many years and opened up many options for Israel. But the treaty did not thrive; it remained a “cold” peace. Meanwhile, the nightmare of Israeli strategists since the day it was signed is that the agreement will collapse and Israel will suddenly find itself facing the worst enemy of all. Despite the fact that this is hardly discussed in an open manner, it is worthwhile to remind ourselves that it can potentially happen. Many in Israel call the Israeli-Egyptian peace agreement a disappointment. But the peace largely stabilized the Arab-Israeli conflict and significantly reduced the chances of a major war like the Yom Kippur War. Peace with Egypt has become a first-degree strategic asset whose importance is evident even now in the violent conflict between Israel and Hamas. Egypt is the chief mediator between the sides in the Gaza Strip and it is the liaison to Arab nations. Egypt is entering its fourth year under el-Sissi’s rule, and it is still in a tumultuous and unstable state. The tourists have fled, the markets lack basic products, explosive devices detonate every day. Internal political turmoil undermines the government, the criticism of the corruption is rising, the Nile water crisis is severe, and President el-Sissi’s reforms are very painful. But the president promises that very soon, it will be good. In the meantime, the Egyptians are having a very hard, bitter time of it. Egypt used to be called “the Land of the Nile.” Indeed, the largest Arab state relies almost entirely on this seemingly endless source of water in its territory. Ninety-eight percent of Egypt’s residents live on the banks of the Nile and are sustained by its waters. The waters of the huge river are directed through massive irrigation ducts to the farmers’ fields, and Egyptians are also meant to use it for drinking water. But the once pure and clear water that enabled Egyptians to live in comfort and abundance is no more. Today the river’s flow is at its lowest level in 114 years, and the salinity is so high that in the not-so-distant future the water will not be drinkable. Already today, microbes and parasites contaminate the water, and jeopardize the health of those who drink it. The primary result of the illnesses caused by the dirty water is blindness. Millions of Egyptians are blind from drinking this water. And who in Egypt has money to buy bottled mineral water? The plan of Ethiopia, where the river begins its flow, to build the Al Nahdah dam in its part of the Nile will give Ethiopians control over the flow of the water and will deeply affect the quantity that will reach the Egyptian part of the Nile. Islamist Mohammed Morsi, the former president of Egypt, threatened Ethiopia that his nation would not hesitate to go to war over the water use. The current president, el-Sissi, is using diplomacy to try to resolve the issue. The water problem is crucial for Egypt because their economy relies on agriculture; more than eighty percent of Egyptians work the land. Once, Egypt had generous revenues from tourism, but the tourists aren’t coming anymore. Egypt once had factories and industry, but thousands of them have closed down since the coup against President Hosni Mubarak in 2011. Wealthy Egyptians have left for America, Europe or South America, and they no longer invest their money in their homeland. Despite all this, many in Egypt trust el-Sissi to succeed in dealing with two central issues: terror that has been striking all over the country, and the economy. “We have patience,” they say. Allow me a personal note here: I have been following the Israeli-Egyptian relationship for more than 50 years, since before the Six-Day War. I was part of the first delegation of Israeli military correspondents who came to Cairo a week after the visit of Egyptian President Anwar Sadat to Yerushalayim. Since then, I have visited Egypt about 20 times. I have met senior government officials, including President Hosni Mubarak. From the first second, I was not enthralled by the peace agreement signed with Cairo. It was a default deal. There was no other choice; the hope was that it would bring about real peace. Not only did the peace not come, it is further away today than ever before. But at the same time, there is a paradox. The peace agreement should make everyone happy with the fact that it has prevented war between the sides for more than 40 years. The lives of many Israelis, and even more Egyptians, were spared. But it’s a very cold peace, and all the governments in Cairo from that day to this have taken everything the peace treaty could possibly give them. Israel, however, gained almost nothing from it. Now that Egypt is under fire from Islamic State, or IS, Israel is helping generously. It shares intelligence with Egypt about locations of terrorists bearing black flags, and when Egypt cannot attack them, the Israeli Air Force sends planes to do the job for the Egyptians, despite the clear and present danger for the Israeli soldiers. In short, Israel is helping Egypt fight a battle that it cannot win itself. Just last week, President el-Sissi declared during an interview that Egypt is very grateful to Israel for the attacks that it is carrying out on IS in Sinai. A short time after he made these remarks, his spokespeople requested that his words be erased. But the president’s words had already been aired. Israel accedes to almost every Egyptian request. Egypt hardly answers a single significant Israeli request. After the peace treaty was signed, certain agreements were reached. These included Israel’s withdrawal from Sinai, which it carried out to the last inch. The sides established that there would be diplomatic relations between the two nations, with embassies and flags, there would be mutual visits by citizens who would come as tourists, there would be trade deals and more. But none of these were actually implemented. The Israeli ambassador to Egypt works in his office in … the Foreign Ministry in Yerushalayim. Not a single Egyptian tourist visits Israel, because Egypt issued a regulation that anyone seeking to visit Israel needs special permission from Egypt’s security services, which does not issue such permits. There are no trade ties. Israel’s biggest problem in this matter relates to the most important part of the peace treaty. Beyond the agreement itself, there was an appendix relating to military issues. It stated that the entire Sinai Desert would be demilitarized; there would be no Egyptian fighters there, from the Israeli border to the Suez Canal, a distance of 400 kilometers. The exception is a corner in the Sinai where Egypt was granted the right to maintain one relatively weak division, with limited weapons. Israel firmly insisted that it be small and distant from Israel’s borders so that if, chalilah, Egypt made a surprise attack one day, it would begin hundreds of miles from the border with Israel and would be possible to thwart in time. But what happened to this clause? Something terrible that is hardly spoken of in the open, certainly not in Israel. In the years since the treaty was signed, Egypt began to secretly dig dozens of tunnels beneath the Suez Canal, through which they could transfer tanks and armored vehicles into the Sinai within minutes. All these routes connect to main roads leading to Israel. At the same time, the Egyptians have built huge underground bunkers in the Sinai. But the primary violation of the peace agreement came after IS fighters began taking hold throughout Sinai, targeting Egyptian soldiers. Cairo secretly appealed to Israel for permission to allow a small military force, equipped with armored vehicles, in order to be able to fight against IS. Israel vacillated whether to allow this, and after extensive discussions it was decided that they would be allowed to bring a small number of military vehicles and soldiers into the Sinai, on condition that as soon as the operation ended, they would get back to the other side of the Suez Canal. Egypt brought its forces into Sinai and launched an operation against IS. During a few battles that lasted less than a week, IS killed dozens of Egyptian soldiers and damaged almost all the vehicles that Egypt had sent. Cairo went back to Israel and asked permission to let in an entire brigade, with its weapons, as well as a few fighter helicopters to provide air cover. They pledged to remove the entire force as soon as the operation would be over. Israel deliberated once again and in the end, in order to maintain good ties with Egypt, gave permission. Since then, the Egyptians continue to fight IS’s 1500 fighters in the Sinai, who kill an average of 30-40 Egyptians each month, and yet they fail to prevail. Time and again, the Egyptians ask permission to bring in more forces and weapons. Egypt has already sent 150 army brigades to the Sinai, along with hundreds of tanks and APCs. It has two military airports with combat aircraft and choppers. 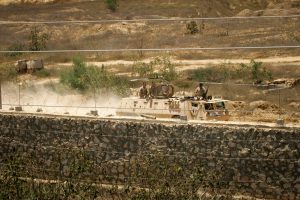 In all, it has between 75,000 and 80,000 soldiers in the Sinai, more than three entire divisions, with all their equipment. The Egyptians don’t seem to have any intention of taking their forces out at any point. They are building permanent bases, paving roads and digging outposts. Israel, whether it wants to or not, is facing a difficult dilemma. The primary clause in the peace treaty is being dissolved before their eyes. 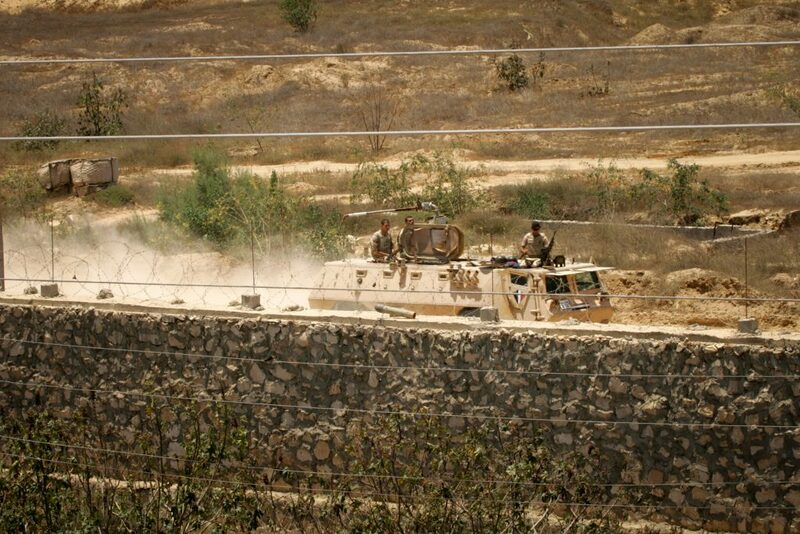 Egypt has returned to the Sinai in full force and its armored divisions are very close to the Israeli border. While it is true that today Egypt needs Israel in its war on IS, and it is playing friendly and highlighting the close ties, the hearts of Israeli senior military brass are trembling. El-Sissi’s rule in Egypt is highly unstable. Beneath the surface, the Muslim Brotherhood is reorganizing. Citizens unhappy with the economy are participating in mass demonstrations. A coup is very possible at some point in the future. And any other government that comes to power will not see itself as obligated to whatever el-Sissi’s government promised with regards to removing the forces from Sinai. At that point, the entire peace treaty will breathe its final breath. PM Binyamin Netanyahu and el-Sissi speak often. IDF officers are in daily contact with their Egyptian counterparts over the border and that is all well and good. But there is no guarantee that a coup in Egypt would not work against Israel, which agreed to allow a massive Egyptian armada into Sinai. It is also important to note: Egypt’s army is the Arab army that purchases the most advanced weaponry and is preparing for the next war. It is arming itself with helicopter carriers purchased from the Russians, anti-aircraft batteries, all kinds of missiles, huge numbers of tanks. Egypt does not have neighboring nations that pose as a threat. Libya on one side is falling apart; likewise Sudan on the south. It is training its division for all kinds of combat scenarios — Egypt is clearly preparing for war against … Israel. Egypt is investing almost one-third of its national budget to arm itself. Those huge sums being invested in the military could be used to stabilize Egypt’s economy, where unemployment is rampant, investors are fleeing and development is stagnant. The military echelons in Israel long ago revised the old statement that there is a “cold peace” between Cairo and Yerushalayim; instead they call it a “cold war.” This greatly disturbs Israeli citizens who know the situation yet have no idea how to deal with it. For many years already, not a single senior Israeli personality has been invited to Cairo. But even in the past when Israeli representatives were invited to Egypt, they met Egypt’s leaders in remote locations, such as Sharm al-Sheikh, the summer palace on the shores of Alexandria, in a remote house in Ismailia and the like. That’s how it was in the days of Hosni Mubarak, but even less during el-Sissi’s time. In the five years of his presidency, he has not invited Mr. Netanyahu to Cairo; he has met him at the U.N. when they both came for the General Assembly or elsewhere, as long as not in Cairo. At the few meetings that they had, there was only one flag behind the two leaders, the Egyptian flag. 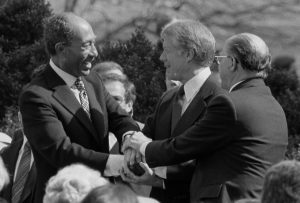 Since the peace treaty was signed in 1979, and to this day, there have been only two visits by an Egyptian president to Israel and they were both during 1979. One visit took place in Be’er Sheva and the other was in Haifa. Aside from these official visits, and from one private visit by Hosni Mubarak for Prime Minister Yitzchak Rabin’s funeral, Egyptian presidents have never visited Israel. Since Israel returned all its Sinai territory in 1982, Egypt from time to time plays the role of the “insulted nation,” continually recalling its ambassador, for long periods of time, using a different excuse every time. To date, the ambassador has been recalled three times for a total of twelve years. Egypt’s policies have remained identical to what they were before the 1979 peace treaty was signed. Egypt leads the Arab world’s battle against Israel. It is the first to vote against Israel at every U.N. session, and has never stopped demanding that Israel withdraw from all the territories, including the Golan Heights. It demands the right of return for masses of Palestinian Arabs and even voted in the U.N. on a resolution declaring that Zionism is racism. And if all that is not enough, Egypt is the one leading the global battle to get Israel to give up its nuclear weapons. One gets the impression that Egypt only went for the peace treaty because of American pressure and out of a desire to get their land back. Beyond that, they do not want relations with Israel, unless it means garnering dividends for themselves from any of the clauses in the treaty, such as including Israel in the fight against IS, which they are not able to manage themselves. The truth needs to be told. Israel has a real fear that at one point, Egypt might upend the existing situation and replace it with significant military procedures. Two of the clear proofs of this are the construction of tremendous military infrastructures by the Egyptian army, and training that seems to simulate a battle against Israel. Over the past few decades that I have been observing and analyzing the Egyptian issue, I have often encountered Lt.-Col. Eli Dekel, who was one of the senior members of the IDF Intelligence Department’s research division. Today he is undoubtedly one of the most prominent experts in Israel on Egypt, and he isn’t sleeping well at night. The facts that Dekel has gathered over the years, and which he presents to anyone he can, can be interpreted in several ways, but they paint a clear picture of a future threat. The political echelons in Israel affirm all the facts that he is presenting, but they are not ready to say anything about the dangers, claiming that “these are sensitive issues.” Dekel rejects all this out of hand, and cites, for example, Egyptian weapons purchases whose scope is unmatched by any other army in the Middle East. “There are fuel storage facilities in the Sinai with the capacity for 500 million liters,” he reveals. Three hundred million of those liters were amassed in just the last three years, which was already part of el-Sissi’s term. The airports in Refidim and Al Arish are being built with military style runways. Egypt has purchased two helicopter carriers. “Why do they need all this?” he asks. But Dekel, who has been involved in military analysis for more than 50 years, and is considered very reliable, reveals that he is not the only one concerned by Egypt’s behavior with regard to the peace treaty; so are many senior officers in Israel’s general command. I think that most of Israel’s citizens feel that this is not quite what we were hoping for. A survey recently conducted by the Begin Sadat Center for strategic research at Bar Ilan, reveals that the majority of the Israeli public, 51 percent, thinks today that the price paid for the peace treaty with Egypt was too high. Egypt has remained, in many ways, anti-Israel. Dekel rejects the answer that building a dam on the Blue Nile in Ethiopia ostensibly endangers the source of life for Egypt, and thus it is building up military capabilities to be able to prevent this. He also rejects the claim that Egypt’s poverty will prevent it from initiating war. This premise holds that Egypt does not have the ability to fund such a war, and also that a war can jeopardize its revenues from the Suez Canal and from tourism, the two central industries on which the Egyptian economy is based. In Dekel’s opinion, the peace treaty with Israel and the military appendix, which limits Egypt, is a burden for Egypt and harms its Islamic culture and dignity. Egypt wants to alter the basis of the relationships between the states, and is preparing militarily for the event that Israel will not agree. “Even a poor country can go out to war of its own initiative, if it feels that it will become wealthy from its wealthy neighbor, and if it has money for this concrete war,” he says. “The IS attacks in Sinai do not serve as a reasonable excuse for the military buildup,” he says. “The augmented construction of military infrastructure in the Sinai by Egypt began in 2004, long before IS came to the region. Between 2007 and 2010, there was a 170 percent increase in the weapons’ storehouses in Sinai and an increase of 130 percent in fuel reserves, all before the first shot was fired by Islamic rebels against the Egyptian army. This fact of increased buildup four years before the IS attacks refutes any assumption that links the military buildup and the Islamic attackers. In any case, in order to fight terrorists, Egypt does not need weapons in Sinai that can suffice for two armies and military fuel reserves of 180 million liters. “When you map out all the attacks against the Egyptian army, it emerges that they all take place in a small area in Sinai. From all the information that we have about the Islamic rebels, we know that they number between 1500 and 2000 men armed with light weapons, rockets and anti-tank missiles and shoulder-launched missiles. So the question is, how is it that Egypt’s army needs more and more forces, including tanks and aircraft, in order to overcome such a tiny force in such a tiny area? “Before the uprising against it, the Egyptian army was a large army which already then comprised 13 armed divisions, hundreds of planes and sea vessels. All these were enough to deal with the tiny number of terrorists in Sinai. Since Abdel Fatah el-Sissi came to power, massive weapons acquisitions are being made, and most of them are not suitable for guerilla fighting. To fight IS, the Egyptian army needs two helicopter carriers? More and more submarines? Missile ships? Hundreds of combat and bombing aircraft? 500 T-72 tanks that bring Egypt’s total tank numbers to many thousands? He then concludes: “Satellite images taken three months ago show that west of the ‘old’ tunnels that Egypt built from the canal inside Sinai before 2004, construction is underway on 28 new tunnels. “From the actual construction work of the new tunnels, we can conclude that the tunnels built before 2004 are filled with weapons that were designated for them. Then there’s the question of what happened in the Middle East after 2011 that required Egypt to build 28 expensive tunnels in addition to the 18 that already existed – an increase of 150 percent? Tzvi Mazel, who was Israel’s ambassador to Egypt, says that “the peace with Egypt is extant, but the Arab extremism and the hatred that it exudes constantly are a threat to our continued existence. The anti-Israeli and anti-Semitic incitement in Egypt is well-known, and the source is the intellectuals in Egypt. They grew up in the age of Nasser, and they are not able to come to terms with the peace with Israel. The other source is the Muslim Brotherhood, whose hatred for the Jews and Israel is fed by the Koran. The representatives of both of these streams, which seem opposed to one another, are at the top of the professional associations of the Egyptian elite, who already by 1980 had imposed a full boycott on ties with Israel. Forty-two years that have passed teach us that sometimes even a cold peace can serve as a good basis for stability. If today there is something serving as a firm basis for legitimate recognition of the state of Israel in this region, it is this agreement. The treaty normalized relations with Cairo and made overall war more distant. It’s the “best of the worst” type of deal that did not bring any good progress, but made it possible for the IDF to cut back its budget by billions of dollars. It is a rather colorless treaty that carries tremendous strategic achievements. The Egyptian Israeli peace treaty is a positive, yet unstable peace. It is unique in that it has held for so many years. Its drawback is that it did not bring about true conciliation between the sides. That is the paradox of peace. The Jewish community is disappearing. Within a few years, not a single Jew will remain out of the largest Jewish community in the Arab world. In its heyday, it numbered more than 120,000 people; today just 15 Jews remain, two men and 13 women, most of them in Alexandria. For some years already, the community has been led by a woman. Now the leader is Magda Aharon, who is very active, trying to preserve what still exists. Recently she attained the agreement of President el-Sissi to invest $71 million in restoring the old shul and community centers of Egyptian Jewry, which are in very poor condition. Most of them are located in Cairo and Alexandria. Twelve shuls remain in Egypt, and they all need renovation. Of those, only a few remain open to the public. The only active shul in Alexandria had part of its roof collapse several months ago. 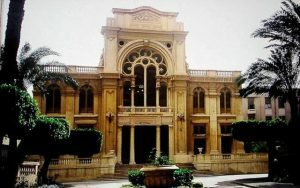 The central shul in Cairo, Sha’ar HaShamayim, which was established in 1900, also needs a lot of repairs to be able to continue to accommodate visitors and the few Jews who still daven there, mostly during Yamim Nora’im and Yamim Tovim. Magda Aharon made up with the representatives of the Egyptian government that a museum of Jewish history in Egypt will also be built, which will exhibit ancient sifrei Torah and holy articles that are scattered among the shuls and the homes of the elderly Jews, who are ready to donate them to the future museum. 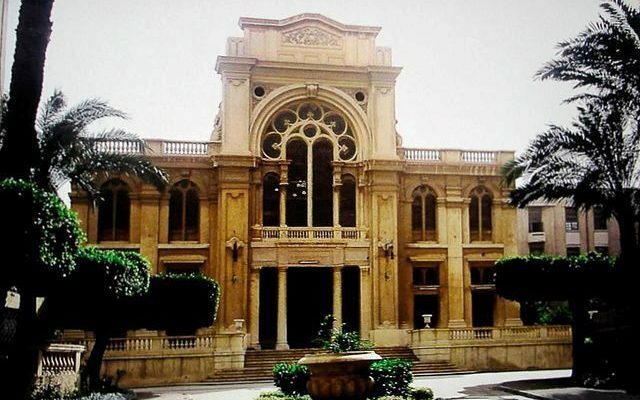 The government of Egypt is officially declaring that it wants to preserve the heritage of the Egyptian Jewish community, but there is opposition among Egypt’s citizens to anything relating to Jews or Israel. The battle against the Jews and the continued ties with Israel are being led by academic groups and workers’ unions. There is not a lot of anti-Semitism in Egypt; still, from time to time, there are those who vandalize shuls and Jewish cemeteries. A few years ago, a small explosive device was tossed into the Sha’ar HaShamayim shul in Cairo; it did not cause any damage.